The Xia Dynasty, ca. 2070 B.C.E. – 1600 B.C.E. is the first dynasty to be described independently in both the official Records of the Grand Historian and unofficial Bamboo Annals, which record the names of seventeen kings over fourteen generations lasting 471 years (another theory 431 years). The legendary Three August Ones and Five Emperors are said to have preceded this dynasty, which was followed by the Shang Dynasty. Once thought mythical, archeological evidence subsequently confirmed the historicity of this ancient dynasty. In this Bronze Age society, delicate jade work was crafted, a calendar was created, trade and commodity exchange developed and the hereditary system of succession replaced what was known as the "abdication" system, in which the ruler retired and a successor was chosen based on ability. It was at this early stage in China's long history that the concept of ruler's social obligations developed, and, typically, it was the tyranny of the last king of this dynasty that precipitated its collapse. This anticipated the later doctrine of the "mandate of heaven," by which a ruler only ruled when they enjoyed the approval of the Heavenly sphere, but only a just ruler would be blessed. Rebellion against an unjust ruler is justifiable, since he has already forfeited heaven's approval. It was the sixth Xia king who reputably initiated "ancestor worship," making the king the protector of their "bones" and linking events on earth with the approval of the spirits of the dead. Chinese mythology starts with Pangu, the creator of the universe, who separated heaven and earth with one swipe of his sword and a succession of legendary sage-emperors and cultural hero's Huang Di, Yao and Shun, who taught the ancient Chinese to communicate and to find substance, clothing and shelter. The Xia dynasty is said to be a prehistoric dynasty dating from twenty-first century through the sixteenth century B.C.E. thus marking the end of a primitive society to a class society. Legend also speaks of a great flood that occurred in the Yellow River Valley. This flood assumedly washed away entire villages as well as valuable crop land. Survivors of this flood where forced to relocate. Some fled to the hillsides others to far off places. Yao, who was reportedly to be the leader of the confederation, called together the chieftains of all the tribes to discuss how to best to control the flooding. Gun was elected to take charge of the fight against the flood. Nine years where spent under Gun's leadership building dams and dykes. However, these efforts would prove fruitless. As more disastrous floods occurred, additional sand and mud were deposited downstream destroying all they had built and eventually bottled up the mouth of the Yellow River causing the flood waters to engulf what precious little land was left. Yao was now getting old and yielded control to Shun. Shun placed great importance on flood control and personally inspected work sties. Gun was incarcerated and killed for failing his mission. Yu, Gun's son, would now carry out his father's mission. After Yu studied the events that led to his father's failure, he enlisted the help of experienced workers and devised a plan of correction. Yu decided it would be best to implement different methods of building dams and dykes. They set forth digging ditches and canals in an effort to divert the flood waters and in doing so provide outlets to the sea. Yu and his men worked 13 years before they succeeded in dredging all the rivers. The villagers who where displaced by the floods where now able to return and convert the once flooded lands into an agricultural area. In doing so they where able to produce such crops as tea, rice, millet and various fruits. Yu would now be known as "Yu the Great" by those who benefited from his efforts. Yu the Great contemplated abdicating his throne to Boyi who had assisted him during the time work was being done to control the floods. Qi, Yu's son, however, had other plans. Qi used his position of power to gain control of his father's throne by murdering Boyi, thus establishing the hereditary dynasty and slave labor was implemented. There have been many mythical stories about the birth of Yu. One states that at three years old, after Gun's death his body showed no signs of decay and when someone cut open his body out sprang Yu. Another is that Yu's mother gave birth to him after eating some sort of wild fruit. It was believed Yu was the son of a god. The Xia Dynasty was said to have been founded when Shun abdicated the throne in favor of his minister Yu, whom Shun viewed as the perfect civil servant. Instead of passing power to the person deemed most capable of rulership, Yu passed power to his son Qi, setting the precedence for dynastic rule. The Xia Dynasty thus began a period of family or clan control. It was during this period that Chinese civilization developed a ruling structure that employed both a benign civilian government and harsh punishment for legal transgressions. From this the earliest forms of Chinese legal codes came into being. The sixth emperor, it is said, grew anxious that unjust rule and high taxes was alienating the people, so he introduced reforms designed to regain popular support. He is also credited with founding ancestor reverence, thus creating an enduring link in Chinese thought between the earthly and heavenly realms. In this thought system, it is only by earning the blessing of the spirits that can anyone prosper, and no one who acts unjustly will ever be blessed. The end of the Xia Dynasty saw an increase in conflict, abuse of power and oppression. Resources where exhausted from the building of places and pavilions, causing the masses to flee in an attempt to escape the oppressive rule. Jie, the last ruler, was said to be a corrupt king. He was overthrown by Tang, the leader of Shang people from the east. Bronze cup found at Erlitou site in 1963. In 1928, excavators at early Bronze-age sites at Anyang, Henan Province found it difficult to separate myth from fact in regard to the Xia Dynasty. In the 1960s and 1970s archaeologists uncovered urban sites, bronze implements, and tombs that point to the possible existence of the Xia Dynasty at locations cited in ancient Chinese historical texts. In 1959, a site located in the city of Yanshi was excavated containing large palaces that some Chinese archaeologists have attributed as capital of the Xia Dynasty; though Western archaeologists were reluctant to make this claim on the grounds that no written records exist to confirm the name of the dynasty and its sovereigns. Most archaeologists now identify the Erlitou culture as the site of the Xia Dynasty. Various archaeological sites have been uncovered at the Erlitou Ruins. Originally, it was believed the palace was a simple structure containing only one courtyard. However, this would prove to be incorrect when field work uncovered a wooden-structured drainage culvert under a passageway between two of the sites. Archaeologist also uncovered tombs lined with cinnabar and traces of coffins. The palaces in the Erlitou Ruins had three avenues, the largest of which being 700 meters long. A calendar was also created using the Big Dipper to track the months of the year, movements of the sun, moon and the stars in line with the twelve lunar months. Modern scholars had dismissed the Xia dynasty as a legend invented by Zhou dynasty historians until the discovery of the Erlitou culture. Radiocarbon dating places the site at ca. 2100 to 1800 B.C.E., providing physical evidence of the existence of a state contemporaneous with the Xia Dynasty as described in Chinese historical works. 01 45 Yǔ Also Yu the Great (dà yǔ). 02 10 Qǐ Established the hereditary system. 04 13 Zhòng Kāng Younger brother of Zhongkang. 06 21 Shǎo Kāng Posthumous child of Xiang. Reportedly founded "ancestor worship," later the official religion of China. 12 21 Jiōng Younger brother of Bujiang. 17 52 Jié also Lu Gui (lǚ guǐ). His tyrannical rule brought about the end of the dynasty. 1 The reign name is sometimes preceded by the name of the dynasty, Xia, for example Xia Yu. 2 Possible length of reign, in years. ↑ Eric Eckholm, "In China, Ancient History Kindles Modern Doubts," The New York Times November 10, 2000, In China, Ancient History kindles Modern Debate Retrieved October 18, 2007. 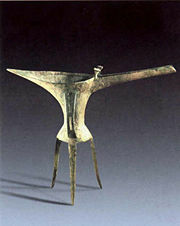 ↑ "Bronze Age China" at the National Gallery of Art, USA, Bronze Age China Retrieved October 18, 2007. ↑ John K. Fairbank, China: A New History (Cambridge: Harvard University Press, 1992, ISBN 9780674116702), 35. Deady, Kathleen W. and Dubois, Muriel L. Ancient China. Mankato, MN: Capstone Press, 2004. This page was last modified on 1 August 2013, at 14:22.